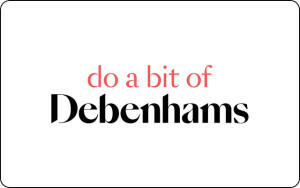 This e-Giftcard can be used as full or part payment for merchandise in Debenhams department stores within the UK and online at debenhams.com. It may not be exchanged for cash or vouchers, used as a deposit on a credit agreement, used to settle a Debenhams Account Card or to purchase financial or travel services, including Virgin holidays. Unfortunately if cannot be used on the following Debenhams Partnerships websites: www.debenhamsplus.com, www.debenhamsflowers.co.uk, www.debenhamshampers.com, www.debenhams-formalhire.com, www.debenhamscurtains.com, www.debenhamsweddingstationery.com, www.debenhamspersonalisedgifts.com, www.debenhamsstoreuk.wgiftcard.co/personalize/debenhams_uk, www.mydebenhamsgiftcards.com or www.voucherexpress.co.uk. The maximum balance that can be loaded onto this e-Giftcard is £2,000. No change or refund will be given when this e-Giftcard is redeemed but any remaining balance may be applied to future purchases. This e-Giftcard expires 24 months after the last use or balance enquiry and any remaining balance will be deducted. Temporary Debenhams Account Cards may not be used to activate or top-up this e-Giftcard. Debenhams reserves the right to reject any e-Giftcard that is illegible or incomplete or where, in its sole discretion, it has reason to believe it is not genuine. e-Giftcard numbers/codes and PINs remain the property of Debenhams (including all intellectual property in the source code). Debenhams is not liable for any lost, stolen, damaged, undeliverable, incorrectly addressed or delayed e-Giftcards or any network failures. Nor is Debenhams responsible for any e-Giftcard that is used by someone other than the intended recipient after delivery. The funds on an e-Giftcard are not covered by the Financial Services Compensation Scheme. In the unlikely event of the issuer of this product becoming insolvent some funds on the card may not be available to spend. Debenhams reserves the right to amend these terms and conditions from time to time where it reasonably considers it necessary to do so (e.g. to change the scope of the e-Giftcard service, notify of the service's withdrawal or in the event of circumstances beyond its control). Reasonable notice of such changes will be given where possible. There is no right to cancel an e-Giftcard purchase once the e-Giftcard has been spent in full or in part. By purchasing and or using this e-Giftcard you accept and agree to these terms and conditions - full e-Giftcard terms and conditions available at debenhams.com. The balance of this e-Giftcard can be checked in a Debenhams store at any till, by calling 0344 800 9091, or online via our balance checker. Debenhams has been a pinnacle department store of the British high street for the past 200 years. Offering something for everyone, every home and lifestyle too - it’s clear why a Debenhams gift card can be the answer to treat another on a special occasion or just because! From plentiful fashion, beauty and grooming departments to stunning homeware, furniture and even electricals - each department will have what you’re looking for. Stocking only renowned and well-loved brands to style you seamlessly like John Rocha, Ted Baker and Levis - men, women and kids too can get every wardrobe essential here. Debenhams gift vouchers could even make an ideal gesture for the bride and groom to-be or newlyweds, with an abundant array of goods for the big day, a little help towards finding the perfect goods is sure to bring happiness to every couple. With toys,entertainment goods and all the products in between available - you can give someone that lifestyle update they deserve with a little help from Debenhams. Print this e-Giftcard page and take it with you to any Debenhams store. Show your Debenhams e-Giftcard code on your mobile phone in any Debenhams store.